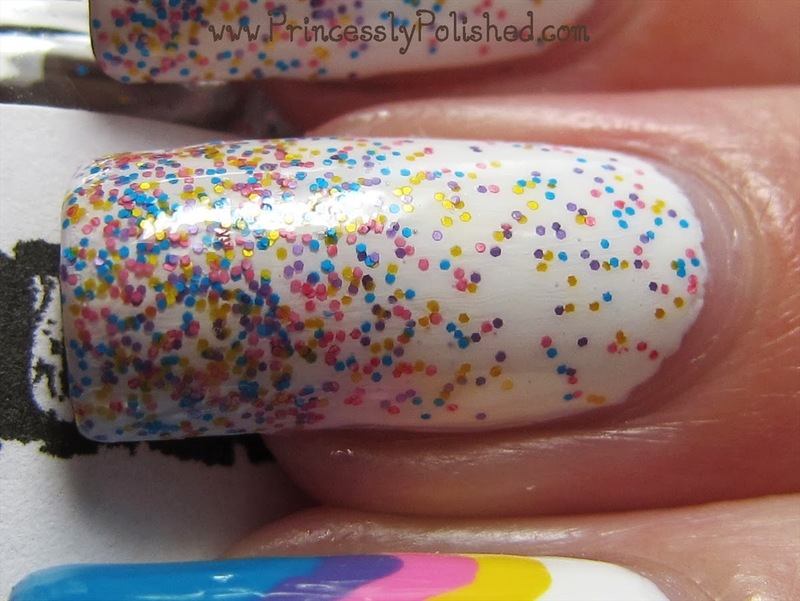 Princessly Polished: Lush Lacquer: Pebbles with Fishtail Accent - Baby Shower Nails! 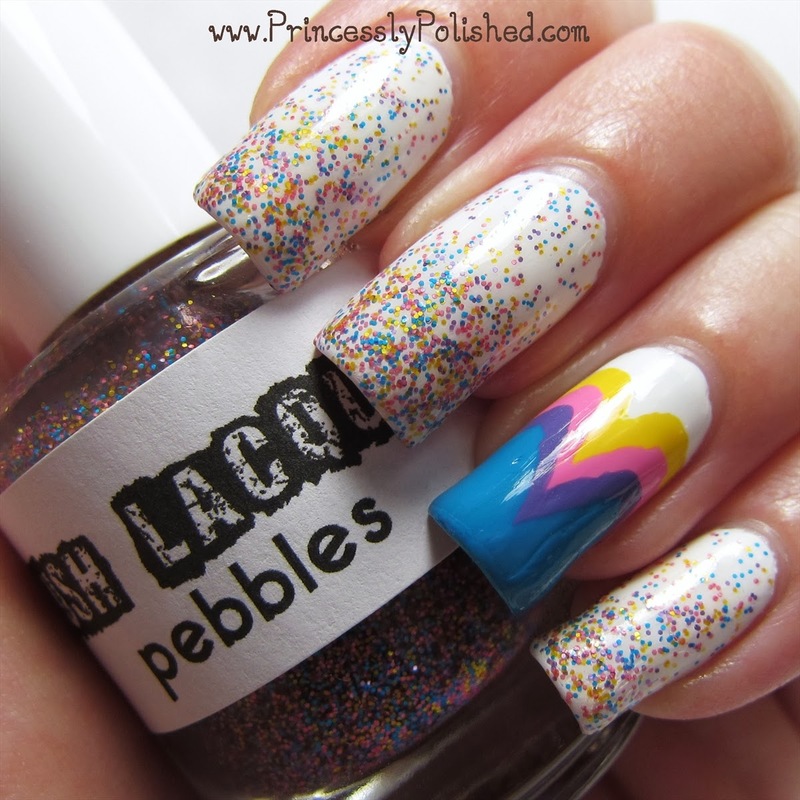 Lush Lacquer: Pebbles with Fishtail Accent - Baby Shower Nails! Working through more of my untried indie glitters, I created this cute manicure to wear to the baby shower that my best friend held yesterday! It was such a nice party. These might not look like very baby-themed nails, but I'm not one for baby motifs. So I went with nice bright colors, instead. Also, Lush Lacquer is created by a mother-daughter team, so it totally fits! All my nails started out with a base coat of white, which was Zoya Purity. For my glitter gradient nails I used Lush Lacquer Pebbles. This is an awesome, colorful matte glitter in a clear base. It looks way better on the nail than in the bottle, where the colors appear muddled because of the tiny glitter size. On the nail the yellow, pink, purple and blue really pop! The glitter coverage was good, too. My nails are showing 1 coat at the cuticle/top, 2 coats from the middle down, and 3 at the very tip. Roughly. I just dabbed the glitter on carefully to make the gradient effect. My verdict is that this polish is great! 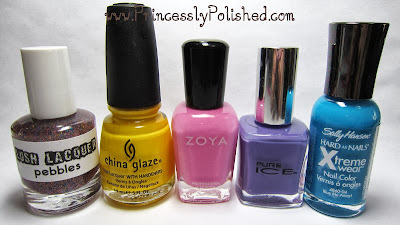 Lush Lacquer Pebbles, China Glaze Happy-Go-Lucky, Zoya Sweet, Pure Ice Fairy Godmother and Sally Hansen Blue Me Away!